So, our little Sulley bear is three whole months old now - THREE! - and is just the sweetest soul ever. 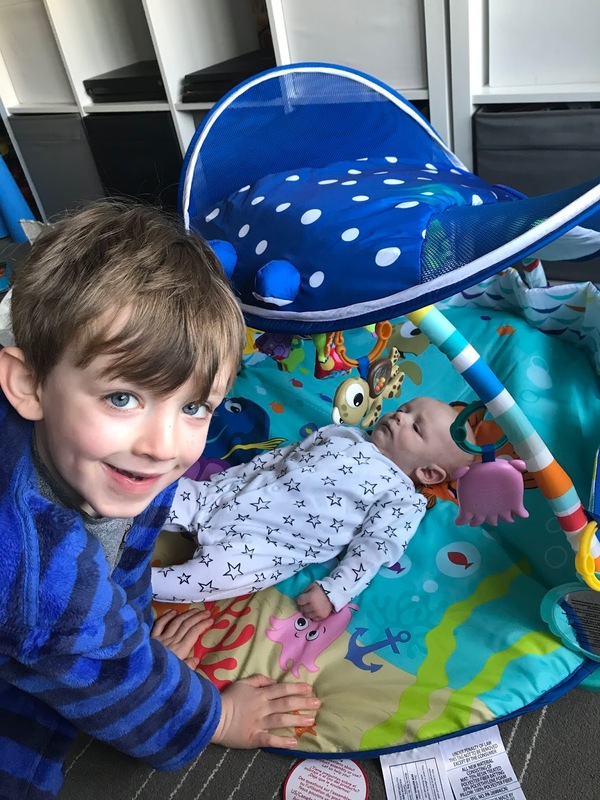 His face lights up with ease when he sees us, he's cooing all the time, making a good effort with grabbing for things and still sticking to the same routine, which helps as he is predictable, and we can't really complain about a thing. Exactly the same! Sullivan really likes his routine and sticks to the same pattern of feeding every two to three hours, 120ml, which often sends him off to sleep, although this happens less and sometimes we can encourage him to take 150ml in one feed. At night time, he's been taking less so his waking up I think is more about comfort than any huge hunger. There was one night he slept through from 11.30pm to about 6am, but that was a complete fluke and has not been repeated! He sleeps well in his car seat and I can be out and about running errands for a couple of hours in the morning and he's quite happy, which makes working out what I am doing so much easier with his predictable habits. He smiles all the time now and can definitely focus a lot more - when he looks at us, he really is studying our faces and taking in every single detail. The cooing is continuing and I think we are close to a first full on giggle, as he makes little shrieks and seems to find things we do funny. He loves bath time and is all smiles when he has one. He never stops moving and making noise, and his movements are becoming more coordinated. On his Nemo playmat, he can grab at the Nemo dangling in front of him, and chats away at it for a long time. He also rolled onto his side the other day, and back again, but that was probably another one off! He's very content, very interested in the world around him and super smiley. Just a joy to be around. He’s still very noisy, always making a sound of some kind, and is always moving - punching, kicking and waving his arms around. He has his hands in fists a lot of the time still, and these often find their way to his mouth! Being stroked on his nose. Feeding! He's a real milk monster. Hitting the dangling Nemo characters on his playmat. Being left in his chair for very long, he seems to get quite bored. He definitely enjoys cuddles and being say with us, like he is involved in what we are doing. The windy issues seem to have sorted themselves out so this past month has been easier and we can enjoy our waking time together all the more. He's about to move into his next round of outfits for Spring which I am looking forward to. We're half way through baby massage, which he loves - particularly looking around at other babies. I'll be joining Mummy and Baby yoga after this course, and we have a meet up with the pregnancy yoga mums I met and their babies soon. In a month, Sulley will be going on his first holiday as we are off to Center Parcs, so this will be full of firsts, including his first experience of swimming - which I think he is really going to enjoy!